Here is a link to a video from the news of this week. It is pretty self-explanatory. I could not embed the video because the embed code seemed to be broken on the news site’s side. Enjoy. It is worth it. Here is an article from today’s North Korean News. I think that this story is a clear view into the thinking of this government, its propaganda, and dysfunction. This is officially from the North Korean government, but the English version is published to the web from Japan. The highlights are added by me. And yes, I do read the North Korean News…nerdy I know, but true. We’ll discuss after the clip. First of all, the title-what government in the world would officially call the leader of its rival country “rat-like”? Further, the title threatens the South with annihilation. This is not a new thing, by the way. North Korea does this on a regular basis. You notice that it says “Lee Myung Bak Group.” The North will not refer to the South as a separate country. It likewise does not call itself North Korea. Its official name is the Democratic People’s Republic of Korea (DPRK). Like many Communist countries, this is funny because the country is neither democratic, nor of the people, nor a Republic. They got the Korea part correct, at least. In DPRK indoctrination, South Korea is actually a rebel group that broke off from the DPRK, and therefore, they are traitors to their country. The next paragraph is classic North Korean propaganda. The first sentence contains a grammar error, and much of the paragraph is run-on, near garden-path sentences. They adore words like “provocative” and “sycophant”. My favorite part of the piece is the “…made by an old man more dead than alive.” They love to throw in these like sentence prefixes and suffixes that have no justification in the piece, as if by simply saying them, the statements become true. This Orwellian idea of double-speak is a mainstay of N. Korean news. Two more paragraphs in, it threatens the South with destruction, that everyone should take seriously because of their recent “striking demonstration” of power. By this, they must mean the failed missile launch a week ago. North (and South) Korea are prime examples of the Asian obsession with face. They will do anything to prevent themselves from being publicly embarrassed. Their failed missile launch was intended to threaten the world and display their prowess around their Day of the Sun celebrations. The embarrassment they see on the world stage will be reacted to in two ways by North Korea: First, like an abusive spouse, they will find a bad guy to focus their anger on. Reading this article makes it seem like the South were the ones embarrassing and provoking them. If you knew nothing about the events of that launch, you would think that the North had succeeded, but the South had mocked them despite their triumph. Their second reaction will be to double down on their rhetoric and provoke further. This article threatens the South in even more harsh language than usual. They will also test another nuclear device in the next few weeks. They might even fire a few rockets, or shoot at a South Korean ship. It is all intended to deflect from their embarrassment. A great question the world needs to ask itself, is if it can afford a country with nuclear weapons, that will use them simply to avoid their own embarrassment. Below, I have linked a video that explains their Day of the Sun celebrations. According to Miriam-Webster one of the hallmarks of what defines journalism is “writing characterized by a direct presentation of facts or description of events without an attempt at interpretation.” The framers of the Constitution of the United States understood that this was a key aspect of a free society. This was inherent in the protection of the fourth estate written into the First Amendment. Bloggers and Foxy News types are always complaining that this has been forgotten, but sometimes we need a refresher course with some easily digestible facts. A recent Hot Air link from the Los Angeles Times gave a snapshot into statistics regarding the current immigration controversy in Arizona. 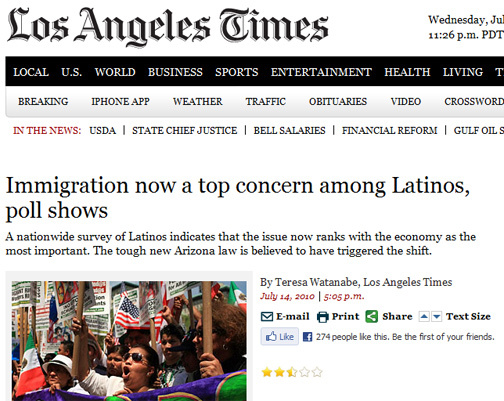 The Article by Teresa Watanabe, Immigration now a top concern among Latinos, poll shows, reported that the poll “of 504 Latinos” revealed that immigration was now the main concern of American Latinos, spurred by the new Arizona immigration law that they overwhelmingly opposed. All of this may be quite accurate. But as usual, there is a lot written between the lines of this article. To her credit, at least the author lists the sponsors of the survey, the Hispanic Federation and the League of United Latin American Citizens (LULAC). What Ms. Watanabe leaves out is that both the Hispanic Federation and LULUC have a very clearly presented agenda that is perhaps important in determining the validity of any survey that they undertake on the matter of immigration. The Hispanic Federation, whose mission is, “To serve our community by building and supporting Latino institutions,” has recently put out a statement both condemning protection of the border and demanding “comprehensive immigration reform” as the only fix for our immigration problem. Keep in mind that “comprehensive immigration reform” is one of those liberal talking-point catchphrases for amnesty for illegal aliens. “We need comprehensive immigration reform so hard working undocumented immigrants, who do the jobs other Americans won’t do, can finally come out of the shadows,” I believe is the officially sanctioned wording these days. When any of these phrases are used, it becomes pretty clear which side of the issue the author is leaning toward. 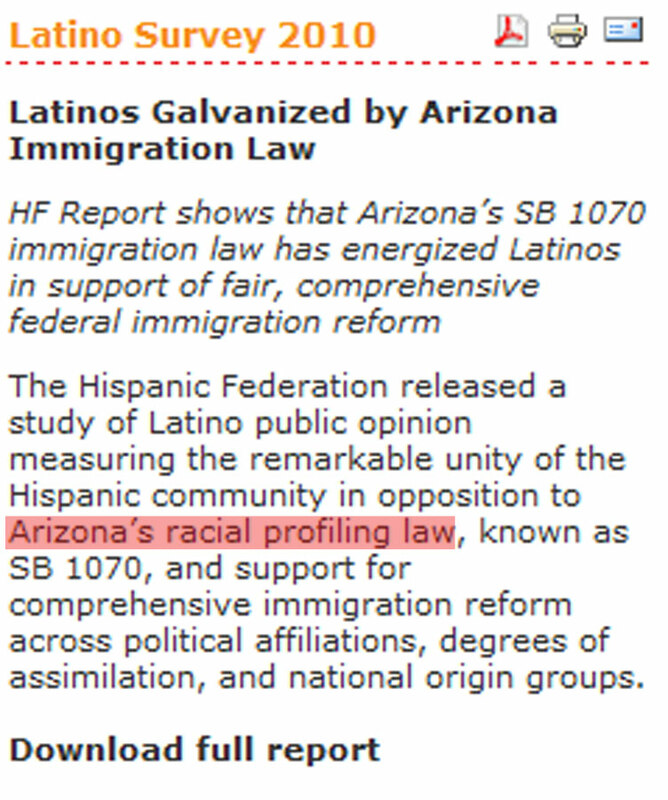 On its homepage, the Federation refers to the survey in question, and gives the community’s reaction to the “Racial profiling law.” One could not by any stretch of the imagination consider the Hispanic Federation an impartial party in this issue. 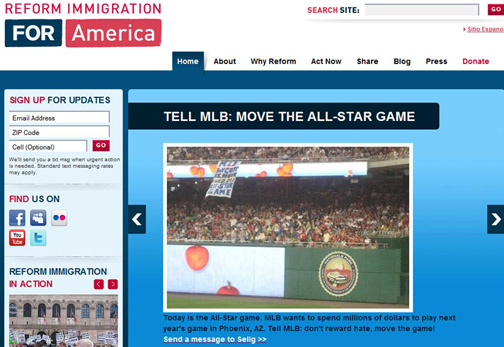 LULAC is far more militant as an organization. 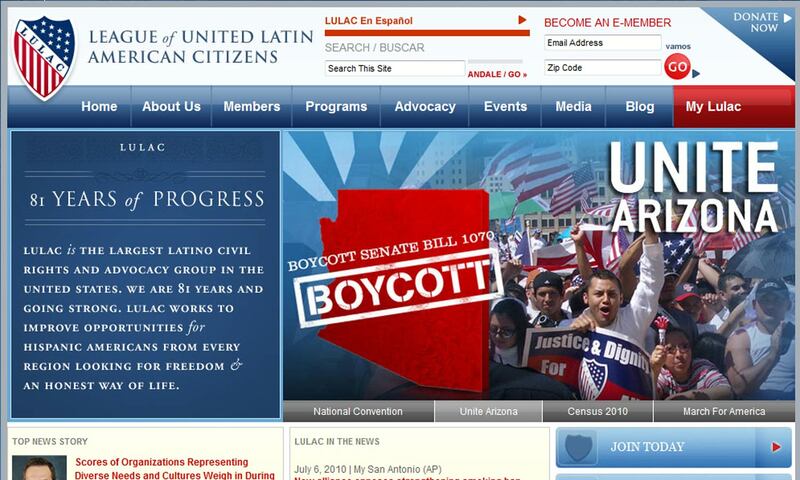 Their website has an open call to boycott Arizona, although they trickily word it as, “boycott Senate bill 1070,” superimposed over the state outline. I guess this prevents anyone from saying they actually called for a state boycott. How clever. I guess they also fail as a disinterested survey party. One would expect better results from someone with a USC degree like Teresa Watanabe. But oh, wait! 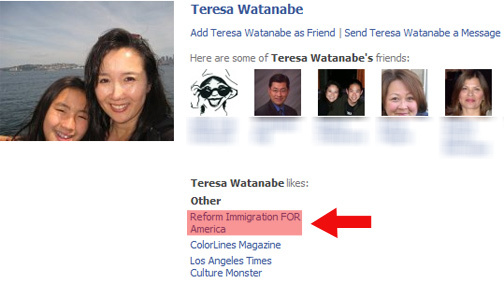 Her Facebook page lists her as a fan of Reform Immigration For America. Their agenda is made perfectly clear. So to recap, Thoroughly researched article—fail; Objective writing—fail; impartial survey—fail; LA Times writer trying to uncover truth wherever it may be found—massive fail. This is no surprise. In a recent survey conducted by RyanShinn.com, the Los Angeles times was found to be unreliable by 92% of respondents. Thomas Jefferson said that, “Our liberty cannot be guarded but by the freedom of the press, nor that be limited without danger of losing it.” He wasn’t the only one with this sentiment. The press was understood as being the main instrument to counter inevitable propaganda intended to control and enslave a free society. As events unfold throughout the year, I do my best to reflect how they have fulfilled my beginning of the year predictions. That said, there are a few recent events that I found noteworthy. First, there was the recent terror plans in New York City and Denver that seemed to have been foiled, at least for now. I had predicted that this year there would probably be an attempt (not that wild a guess, really). I also Twittered about the likelihood of one upcoming soon merely weeks ago. There is a good article about the recent situation here. This is part 7 of a multi-part series. Read part 1 here. Exactly what to expect for America itself in this future, is very difficult to say. Possibilities include a weakened America existing in its same form but having less world influence, to America’s basic destruction by both outside, and internal fighting, or America existing more as a pre-Civil War loose collection of states. There is no way to predict what the American future will look like at this time. But that doesn’t really answer what will happen to the American and world Christian outlook. Christianity does not rely on Americanism, of course. But America does powerfully affect the world Christian community. While the growth of the Christian faith is epicentered in both African and Asia, with secularization and Islamification being more prevalent in the West, America is still the center of the financial, resource, and influence world of faith. The loss of America’s influence will certainly have a huge affect on the Christian world. But how this will work itself out in time is not estimable at this time. Certainly, there will be destabilization in the Christian community. This will most like work itself out to mean that there will be no Capital for Christianity. It might also end in increased persecution around the world, as there will be no powerhouse to protect Christianity’s interests. However, history tells us that persecution is good for Christianity, as it causes the Christian community to invest fully in their faith, to make Christianity less a culture, and ends in enormous numerical growth. As Christians, we don’t have to worry about the future of the Church. We know what happens in the end. We don’t know all that will happen between then and now, and we certainly know it won’t always be easy. This is part six of a multi-part series. Read part 1 here. Read subsequent posts here. We have gone past a point in America where we can turn this clock back. Many experts believe that the American century is over, and the next century most certainly won’t be a repeat. I believe that the evidence backs this up, both historically and in terms of current events. This doesn’t mean we will fall into the sea. It does mean that things will be different. A look at history should shed light on what may be to come. When the empires of Babylon, Persia, Greece, Rome, Britain, and The Soviet Union fell they left differing decrees of chaos in their wake. The latter empires left lesser degrees of chaos, but their empires were also dovetailed with another stabilizing empire (in both cases the United States). The Romans were unique in that there was no other competing empire to really challenge their existence, similar to the situation that the United States faces today, although certainly the European Union (itself a powder keg) Russia, and nations like Canada and Australia are stabilizing. During this time, the one rising competing empire was the Muslim Caliphate leading to the Ottoman Empire. The rapid expansion of the Muslims into the carcass of the Roman Empire was almost without challenge. When Europe finally realized that they needed to respond, it led to the Church controlled Middle Ages, and ridiculous Church corruption and pollution by the world. It was hundreds of years before the Roman norms of indoor plumbing, rights for middle class, and secure resources where even imagined again. As America loses its stature in the world, this does not have to echo the fall of the Roman Empire. The European Union could provide stability in the absence of America’s influence. Most other countries would likely lack the resources to be capable of this. However, Europe has its own massive battles to fight. Europe is in sharp decline, at least as the Europe that has existed for modern history. They are facing another Muslim invasion, but this time it’s a more peaceful one. Within 10 years several European countries will be majority Muslim, and almost all of Europe’s non-Muslim population in irreversible decline. This is part 5 of a multi-part series. Read part 1 here. Read subsequent posts here. There is another cycle at work within America that we need to be aware of. Just as revivals in the early 1900’s brought about the Pharisee-ism of the early 20’s, which led to crime in the 30’s, we are in a part of our own cycle now. The Bush years seemed to be a revival without revival, and a triumph of moral legalism (at least as far as the mainstream media and far left would have us believe). The public responded with a “Yes we can believe in change.” But now crime is seriously on the rise and healthy society markers are on the decline. Of course, forces completely outside of human control, or at least strategic planning, could change things in a heartbeat. But today the decline is possibly spinning out of control. This is also the first time in modern America where our moral compass has no North. Think about it for a second: The state of California (and they are not alone in this) has increasingly been restricting any and all tobacco use. This is not a bad thing, really. But at the same time, the state has been rapidly relaxing marijuana laws. There are now cities where it is legal to smoke pot on your porch, but a Marlboro will get you a hefty fine. This is part four of a multi-part series. Read part 1 here. Read subsequent posts here. So what is next? Are we on the cusp of a new cycle, or are we coming to the poem’s bridge? Maybe we are finally poised to break out of this iambic pentameter, and start a new ee cummings Dadaist phase. If historical reality is allowed to sink in, I fear that the forecast is pretty bleak for our little stanza. As history is somewhat-cyclical, then we need to have an understanding of 2 main issues in order to estimate where we are going. Essentially, it is the same as understanding getting anywhere. We need to have a basic understanding of where we are now, in relation to all that is around us including our momentum, and we need to have an understanding of where the path we are on is going. So where are we in the historical pattern? What direction have we been going? Truth be told, we have been in an era of unprecedented blessing. My generation is really the first generation in America who has known no real hardship. Generation X was born after the debacle of Vietnam, and though there have been wars since, they have seemed no different to the average American than movie trailers being played during Prime Time TV. There has been no gas rationing, no Polio, and since the toppling of the Soviet Union there hasn’t even been a real threat to our way of life. All of this created the circumstances that made 9/11 such a powerful moment for our time. We have been dwelling carelessly in the west, as if we were teenage boys, shielded from any possibility that our bones could break, our wallets could empty, and our lives could actually end someday. Our foreign and domestic policies nationally have been mere macrocosms of the average American family. With out of wedlock birth rates aroung 50% and our budget running in the red every year, our only answer to our problems was to go out and buy a nice present to make ourselves feel better. We are responding to the current economic crisis by firmly placing our heads further in the sand. Just like an alcoholic responding to an intervention by drinking himself into a stupor, we have responded to astounding national debt by creating a CARS program designed to spend more money helping people to buy cars that neither the government, nor the consumer can actually afford. No one of accredited education could believe that we could continue such ridiculousness, and it is almost beyond believing that we could even pull ourselves out of this mess without massive cultural and governmental overhaul. If we truly want to know our location, it is teetering on a cliff, and we have responded to the danger in typical lemming fashion. Great Empires don’t usually succumb to sudden external attack. Sun Tzu was right in saying that an intelligent enemy would never attack in a way that plays to ones strength. Our civilization’s enemies would rather sign our death warrant in much more strategic and subtle ways. Great empires have usually been defeated at the hands of themselves more than their sworn enemies, anyway. As Lincoln said, if America was doomed, that its end would come by suicide. Both the Greek and Roman civilizations fell apart as their societies descended into decadence, and then turned on themselves when they could no longer support their own lifestyles. Foreign invasions were just clearing the already rotten carcasses of these empires. The British empire ended because the small island had clearly overstretched herself, and exerted her influence far beyond what she could actually defend. There is no reason to believe that we are not in the same position.